A little later than expected, but I guess late is always better than never. 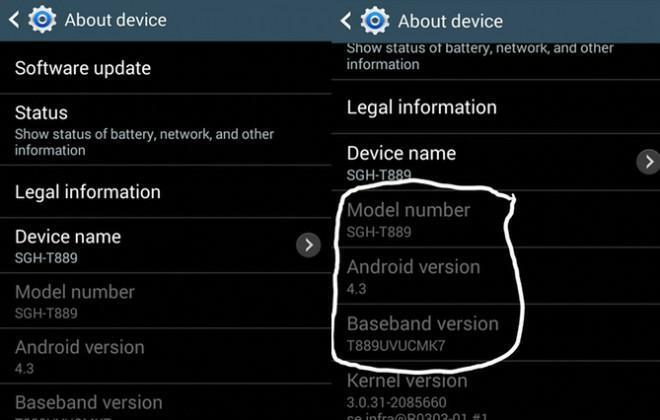 Android 4.3 has finally arrived for the Galaxy Note 2, a week or so later than was planned. A handful of readers have emailed/tweeted us to inform us that new software is available to download now. It should be available as an OTA update, but if it’s not showing up automatically, head on over to the settings menu and check manually. Let us know if you’re seeing the update, and if you’ve managed to install it without any issues. What the delay was for, we don’t know, but if it was anything like the delay for the other Samsung devices, it’s more than likely a few extra days to iron out a few bugs. Last week, we had heard from one user that they’d managed to get it installed ahead of public release. But, upon trying again, he couldn’t repeat his success. This time it’s official. So, go download. When will 4.3 reach lebanon? When is 4.3 comming to lebanon?? Checked my Note 2 and it is downloading 4.3 now as I type. It’s there. Downloading now. 614.55 MB. Thanks for the heads up! hmmm, I don’t seem to have this error on mine. I am using the full month widget. my note II’s at home. what’s the new features that comes with it? That’s so great that you pointed this out. Thanks buddy! I have 4.4 on my Nexus 7 and can’t wait to revert back to 4.3. This to me is a case of “just because the version number is higher does not mean its a better build.” Also, for me vanilla android is too boring. I need bells and whistles in my roms. If not I might as well go get an iCrap. The upgrade has caused a significant lag in some apps (wave launcher) and overall experience. Power users that have highly customized their phones will be the hardest hit. TRIM may eventually help and I haven’t tried a factory reset (hate reinstalling everything) to see if that fixes the lag. The upgrade did go smoothly but the lag is very disappointing. Just installed. Runs nice, butno emoji keyboard… using GS3-LTE. Mine doesn’t lag!! !… a few of my friends with SGN2 also had lag problems?, I wonder why?, it must be something different of the apps that is causing this, I will get the worst one of the bunch to do a hard reset and install the same apps and see if the Lag persist. I have 41 apps from Google Play Store and 13 from Amazon app Store, I am curious if some of these apps cause problems with Touchwiz UI?, I will post later in the week of my results, as I’m going to update to 4.3 on Wednesday, so I will do a hard reset and clear everything for best results on any upgrade on OS. My Galaxy S3 is downloading 4.3 right now! I swear! Umm yea, it been out for a week. If you take a close look, the color reproduction is slightly better too.. the new browser is great!! After waiting so long, all I really wanted from this update was the new weather widget, and Samsung couldn’t even meet my lowest expectation. Disappointing. This article is about the Galaxy Note 2 OTA update to 4.3, but people are posting about other devices? ?….interesting…very interesting….LOL! Who are you going to go with? HTC didn’t update a single US phone from last year to 4.3 and the same goes for Sony and LG. lool .. If this was Samsung of 3 yrs ago id be with u but its not. They have actually had the fastest updates outside of a stock Google device this yr. Especially on Tmo !! It was a longer wait but I appreciate them skipping 4.2 for 4.3. Made more sense. i think moto x was just updated to 4.4 kitkat a week after Google released it. Hey ,better late than never.There no bugs in it and it a lot more responsive,no lags,and it brings new life in the Note 2. 2014 I set it off with the Note 3,in black like all my toys. My note2 runs great with 4.3 smoother a little quicker not that it was slow before by any means. My flash player in Stock browser is crashing. I will try to update flash player or try another browser. Everything else has been nice like a new phone. Flash player on firefox works! Everything is great! !! No issues so far and it’s faster than before. My short cuts are gone from my lock screen, & why can’t I add widgets to my lock screen ? Any one else having this problem ? on lock screen – pull down time widget, then swipe left to add other widgets. When will it be available worldwide? No issues. Only thing I don’t like is you can’t use the flash in HDR mode. In the past, I was never able to use flash with HDR. Yes, I can’t remember the mode I had. It was set that it took two modes of pics, one was more vibrant. I can’t remember or find it in this one. But I’m good now. Group play does video on s4 4.3, does it do it now with the update on note2 4.3? Just curious. Anyone else not digging the screen and colors after the upgrade, or is it just me? Is there a setting I need to play with the get my screen colors / contrast / gamma back to what it was before the update? Still reading mixed results…still waiting to upgrade my Note II until I read more positive postings after the update….keep posting and thanks…. Great upgrade for me. No complaints. Auto correction(or should I say changes correct word to something totally incorrect) during texting is annoying. I have to learn new steps to ensure I insert correct words, after actually typing them correctly. Sprint Note 2, SF Bay Area: just received 4.3 update on 12/9/13. I’m on 4.3 It seems snappier with the update. I like the look of it much better too. Settings menu is better organized. G Note 2.. Update received. Downloading now..
Just updated my note II to 4.3 and its much brighter, faster, and more organized…like it!…only thing I see is …I have Go Launcher installed with themes and when I transition from one page to another…the widgets slack only a bit to catch on but besides that…its working great! Thank you…. I haven’t received the 4.3 update for my Note 2 did anyone from Verizon receive the update for their Note 2 hope we’re not going to miss out if so hopefully we’ll be the first ones to receive the newest updates after 4.3 since we got missed…. Um…. This is a T-Mobile board, not Verizon…… You might try them for an answer…. Installed the 4.3 update on my TMo Note 2. Definitely different and I’m loving it. The only issue I have is that TouchWiz keeps force closing as I swipe from screen to screen. Any Suggestions TMo Family??? Go to Settings > More > Application Manager. Swipe all the way to the right under “All”. It’ll reset your homescreens, but maybe it’ll fix your problem. On a Note2, any of you ever tried a video call while not on WiFi? What app do you use to make video calls (while not on WiFi)? Does the app allow rear camera operation during the video call? I use Google Hangouts for video calls. Works just fine e on and off WiFi. Just in time for 4.4 for every other phone! After the 4.3 update, anyone else miss the Driving Mode? With 4.3 you get the new Hands Free mode that does NOT read out text messages, but still reads the senders name of the incoming text. I used the Driving Mode when doing chores, working, etc, so I could leave my phone in my pocket and just listen to new texts and reply to them if important. So now the Hands Free mode makes me use my hands to read the incoming text, so its not so hands free after all. Any locate a app that actually works to read the incoming text automatically? I got an update notification and hit the wrong button and it closed without updating. Anyone know hoy to get the update now? I don’t see it in settings>system update>Update Samsung Software.